There are many web sites out there about Beethoven. If you have a web site with content relating to the composer, please feel free to send it to me. I'll review it and maybe list it here for the world to see. You are always welcome to make links to this web site. 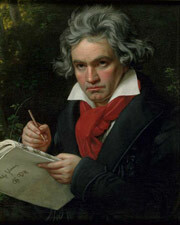 Ludwig van Beethoven web site. Very comprehensive and available in several languages. Plenty of information about the composer, his music, letters, students, teachers and love interests. Interesting and informative to read.